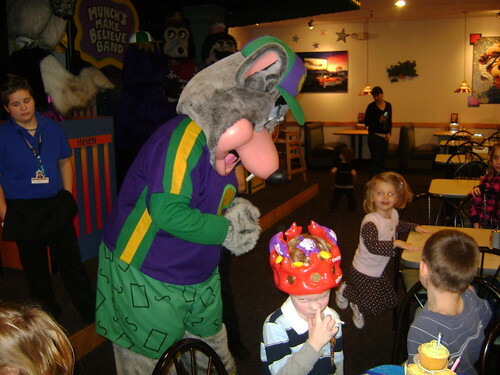 While walking through the screaming, steaming, teeming, germ-infested labryinth that is Chuck E. Cheeses, little Ethan squeezed my hand and whispered in astonishment, “I can’t believe I’m five!” He said this with the same reverent awe that a young bride might say on the morning of her wedding–I can’t believe I’m getting married!–his voice full of wonder and hope. I can’t believe it, either. How could five years have passed since I brought our pink-and-white baby home from the hospital? How can we already be done with bottles, diapers, potty-training, and tantrums? (Okay, three out of four’s not bad.) How can my youngest, the baby, already be telling jokes, drawing masterpieces, taking showers, asking if he can drive, and be in full-time Jedi training? How can his funny, spunky personality already have seen five Christmases and Easters? 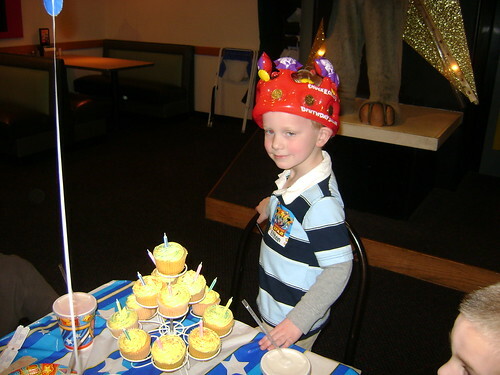 In spite of Ethan’s treacherous act of getting older, we had a very happy birthday. 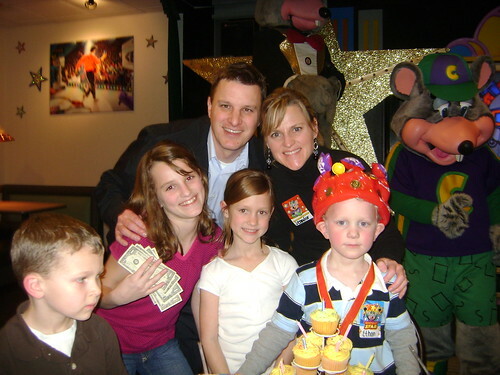 Just once in their young lifespan, I allow each of my children a birthday party at Chuck E. Cheeses. (Megan rejected this offer.) (She is completely terrified of Chuck E.) (Smart girl.) So it happened that Year Five was when Ethan’s robust boyhood dreams would come true. 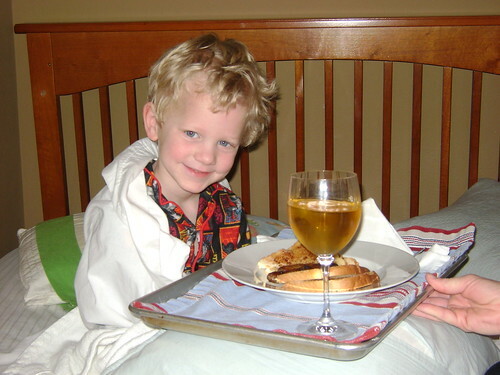 We kicked off the big day with the traditional birthday breakfast in bed. As you may have guessed, we followed up this meal with a much-needed haircut. 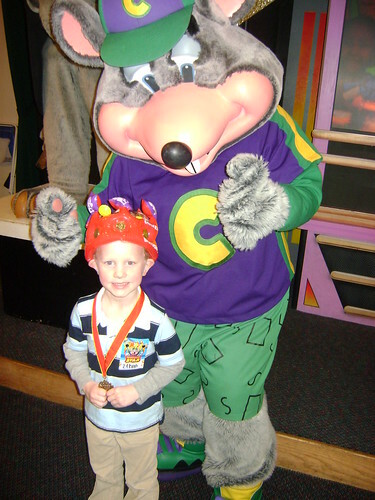 Hours of anguished waiting later, it was finally time to meet Chuck E.
Sorry about cutting off your head in this photo, Chuck E.
But at least I didn’t do it for real. Which is what I really wanted to do. but Ethan had other plans. 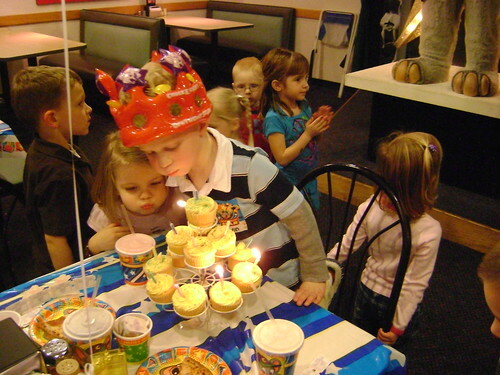 helping him blow out the candles? At least, we assumed she was adorable. She just wandered over and helped herself to our cupcakes. By the end of the night, three other anonymous girls had followed suit. We didn’t mind. Their parents are the ones who had to worry about stranger danger. No skin off our frosting. You cannot imagine the sweaty head that lurked beneath that latex. A good-lookin’ (okay, tired and greasy) crew. with gold tokens: beautifully! 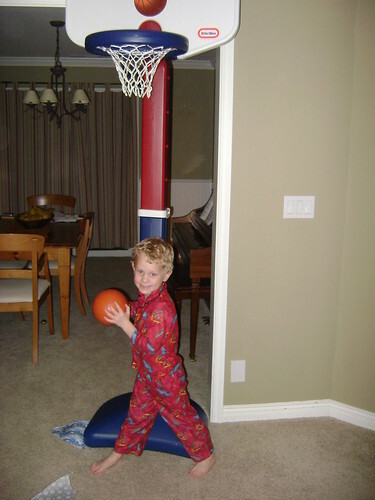 And he’s a pretty impressive shooter, too. Impressive–and adored–in so many ways. Let the years keep on coming. We’re loving every minute of it.